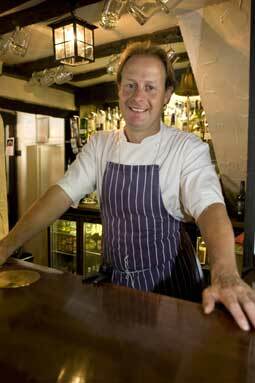 Q: In January 2007, you moved from the Hinds Head in Bray where you were head chef to the Royal Oak. How did that come about? A: My partner had been working at the Royal Oak for two years and knew that Nick Parkinson the owner had been looking for the right chef for a while. I met him and restaurant manager Mo and we got on well. It's as close to owning my own restaurant as I can get without having to take on the risk myself. Q: What was it like working for Heston Blumenthal? A: I loved it, he's a brilliant chef. Heston is unique; what he does is technically brilliant, the flavours are brilliant, no one can touch him. The Fat Duck was a very important part of my cooking experience, it made me realise that even a small amount of attention to detail can make all the difference. But when you're working under a big name chef like Heston, you come to a point when you've done everything you can and you want to expand your own ability so I felt my time at the Hinds Head had come to an end. Q: How would you describe your style of cooking at the Royal Oak? A: I'm about fresh seasonal ingredients cooked simply - wild sea bass as big as I can get; big scallops from Scotland and longhorn beef direct from the farm. I love discovering new things. One of my fish suppliers introduced me to sand eels a couple of weeks ago which are like whitebait but longer. I deep fry them in special "frying flour" from Spain which has a larger grain than usual and makes them really crunchy. Q: So the food's British? A: I'm very interested in British ingredients but I don't want to be restricted by them. I've got buffalo mozzarella on the menu but it's not the stuff made in this country! There's Italian, French and Spanish influences but I'd never put curry on the menu. Q: Is the Royal Oak a gastropub? A: I've got a real problem with that term; it sends a shiver down my spine. It's been exploited, bastardised and devalued. I used to work at The Cow in London - that was a gastropub but now every Wetherspoon's is a meant to be a gastropub. The Royal Oak is a restaurant really. We get regulars at the bar on a Friday night and Sunday lunchtime, but it's mostly diners. Q: Are you limited in what you can do in the context of a pub? A: Well, we do a bar snack menu of sandwiches, burgers and omelettes and if we didn't we wouldn't be as busy for lunch. So that's where you meet your limitations; you have to give people what they want. It's important to know your identity and I think we've got it right. People come for dinner but you can come in for a pint and a scotch egg at the bar if you want it. Q: What's it like having Michael Parkinson as a boss? A: He's a lovely bloke. He comes in for lunch everyday and chats to everyone. He loves fish but he'll order the hare and trotter pie or a special if there's one on. He used to go to Scott's of the Ivy after his show but now he comes here because he thinks the food is better.